The gender gap in startups is well documented, particularly in the area of finance where research shows that female entrepreneurs raise smaller amounts of capital to get their businesses off the ground. Fortunately, the startup environment is starting to change, with more focus on helping women start businesses and scale up quickly. For example, at SXSW 2017, I interviewed Sara Brand of True Wealth Ventures, a micro-VC that invests in companies demonstrating gender diversity in leadership positions. Then, at Dell EMC World 2017, I had the pleasure of speaking with Carolyn Rodz, the founder of Circular Board, a collaborative accelerator for growth-oriented female entrepreneurs. If the name Circular Board rings a bell, it might be because you read about them in another article from my Dell EMC World video series – my interview with Elizabeth Gore, who told me about a fascinating technological innovation called Alice. Alice is an AI business mentor specifically for female entrepreneurs, which was created by Circular Board to help further their mission. 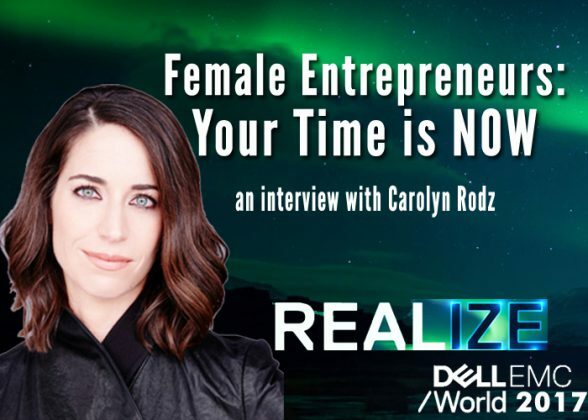 @CarolynRodz of @CircularB discusses the future for #female #entrepreneurs at #DellEMCWorld. Circular Board already holds 3-month virtual accelerators for women as well as an annual Circular Summit. Alice was designed to reach more female business owners who need business advice and resources to grow quickly. “I’m very excited about Alice. I think she’s going to change the world." You can hear more about Alice by watching the video above, plus learn how it works by checking out this article. This is part of a Dell EMC World video series that also includes a series introduction with Erik Day plus interviews with Bert Park, Erik Day and Brett Hanson. We have a final video yet to come, so stay tuned!